When we walked into her living room I noticed this adorable large teddy bear sitting on a chair. I walked over to it and couldn't help but pick it up and give it a cuddle. I should have learnt my lesson about being so free with my love. Sometimes things aren't what they seem. At all. "Oh" she said as she rushed over to me, "this is David." "He is lovely and ...quite heavy" I said. 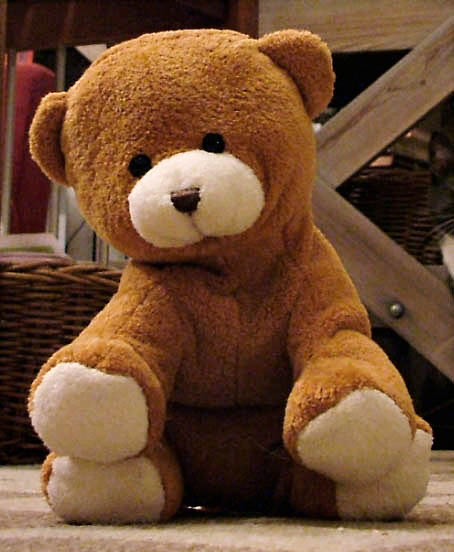 She then took the bear gently from me, patting its back as she held it tightly. She then went on to tell us that 'David' was her son. I looked at my mother and rolled my eyes. Clearly her neighbour was a lonely old nutter. The lady told us that David died when he was 24 and she had decided to sew his ashes into his childhood bear. That way she was still able to hug him and talk to him whenever she wanted. She even takes him for outings in the car every weekend. That bear, or David sorry, probably has a better social life than I do! I am really, really immature as you know, but I found it all really weird and very uncomfortable. Death is fine. Inevitable. I don't have issues with that. In fact, I am going to be cremated one day myself but there is no bloody way I want someone sewing my ashes into my old teddy bear (even though he could use some filling the poor old thing). And while I've always wanted a body like Barbie I don't want anyone taking her head off, pouring me in and putting me on the mantelpiece to live my barbie girl dreams, either. Yes, totally and absolutely ridiculous. But now I have become a bit obsessed about the whole ashes thing. What will I decide to do with mine? No, I am not going to let my daughter decide after the event because she is sure to accidentally misplace me. She has a habit of losing things on the tram, at bars, shops, on planes, so who knows where I would end up? Besides, people do strange things with their loved ones leftovers. I recall being at a football stadium in Scotland and seeing some fan's ashes being scattered on the pitch just before a game started. All I could think about was the poor footballers who were going to be slipping and sliding all over the pitch and would end up being covered in someone else by the end of the game. No-one else seemed to have an issue with it. Just me. So what other options are there? I started googling for ideas. Jesus Christ is all I am saying. Did you know that Maurice Gibb's (Bee Gees) ashes, for example, were turned into some diamonds and shared around the family. What about being put in a rocket and blasted into space? Or scattered whilst on a ride at Disneyland. There is a man who keeps his wife in his bed on the same side she slept for fifty years. Or the people who mix their loved ones ashes with clay and turn them into coffee cups or ornaments. Or what about becoming your very own snow globe? My favourite would have to be this one. Get ready. Your ashes can actually be made into food grade vitamin tablets that can strengthen your surviving family for years to come. Imagine. You can actually be eaten by your relatives. Hopefully I would cause them severe indigestion if they tried that on. I am not doing any of this. I personally don't want my ashes to have more of an exciting time then I got to have when I was alive. So they are getting buried.....anywhere. Don't mind where but it needs to happen quickly before anyone has any funny ideas. So tell me, what are your views about this whole keeping of ashes thing. Is it just me or is it all a little odd? Or am I missing something? Well, I don't think any of it is odd. Whatever gives people comfort and solace is what they should do. Would I do some of these things? No. But, that's me. Lilly, immersion of ashes in the holy rivers is the custom in India. When my mom passed away rather suddenly, I was her only child around in India, the others being in the US. I immersed her ashes in the Sea , hoping the waters would one day lap at a beach in the US close to where her sons live. When she used to visit them , she often loved gardening in their small gardens, and had absolutely green fingers. I reserved some of the ashes in some very small containers (about 5 grams in weight), and someone took them to the US, where my brothers spread them amidst the roots of the trees she had so lovingly planted. Ashes is just a symbolic thing. I didnt do the sacred rivers thing. I thought what we did was equally sacred. Our parents dont really go away. They remain in our minds and in our thoughts and lives, because we are who we are. Well, I never considered the option of ashes sewn into childhood toys .. however I do think that if this is what brings comfort to that mom, it's all OK. My mother's ashes were divided into three portions .. one for each daughter. We also saved out a portion to spread over our father's grave and our step-father's grave. We did this on my mother's birthday - which made it even more memorable. As for me, yep .. ashes it is. I am leaving it totally up to my children! my dad was cremated and he's in a cemetary in a special place for ashes. We don't seem to be people who even visit the site much, unlike other people. He is in your hearts and memories, that's enough really. Bizarre they are but yes intriguing indeed. The digestable vitamins were my favourite. There is a market for them Mike, you could be on to something! Only Mr Smith could think of a unique idea like this for his ashes......as usual you are make me smile Mike. Yes Peggy, he has a way with words and a fabulous sense of humour to match! Oh the possibilities - mixed into fireworks would be cool. I don't really care and I might take the slow decompose route. My brother got a strange request. An old friend whose wife had passed asked my brother to mix the couples ashes together after he passed. It was years apart but my brother remembered and did it. Yes I imagine you would love to go up in a rocket Bill. At the end of the day we are not going to be here to concern ourselves with what happens after we pass. But I will be leaving strict instructions about anything too weird nonetheless. Thanks Bill i will be over to comment - love your links. I told my daughter about the ashes being turned into a jewel thing. She said, "Let me make this perfectly clear, Mom. I will not wear you after you're gone." I haven't mentioned this to our son so I don't know what he'd say. He doesn't wear jewelry so there's probably no hope there. I've told Art that the best thing might just be to be interred at Punchbowl National Cemetery. Actually he just wants his ashes to be scattered in the mountains or ocean. He says that after he's gone, he doesn't want to take up anymore space in the world. After watching 'Night at the Museum' told the kids to have me stuffed and stand me in the corner. Gosh you are generous to your kids, upkeep and all. Wonder which one will keep you or will you get rotated around them. Poor kids, lol. Lily, Recently when our granny passed away we immersed her ashes (all in all it was 100gms of it)in a holy river.It was a huge moment of realisation that after death ,this is what is left of your body .at that moment it felt as if we were letting go of the last remains of hers but as time passes we realise that she is alive in our memories ,and thats the best way to be preserved in the mortal world. I think , i would prefer to be preserved in memories than in ahses. Lovely comment Kirti. Yes I agree its the spirit that counts and memories are indeed the best way to be preserved. Okay, Charleton Heston just popped into my mind yelling, "Soylent Green is people!" Thanks for that image. ;) I have to say, though, I think the teddy bear is both sweet and a little sad. It really tugged at my heart strings. LOL Janene, you are so funny. No it didnt tug at my heart strings, it was kind of all shades of wrong for me although I appreciate that it is hard to let go. Whoa-- That's kinda creepy-- the ashes are IN the bear. Wow. Never would have thought of that one. I did a post a while back about a box of ashes that we "found" in the back of my folk's garage. It was my step-father's uncle that no one wanted! Also kinda creepy. We took them to the cemetery and scattered them near the graves of his family. I have an aunt who keeps her husband's ashes on a shelf in her kitchen with his glasses propped on them so he can "keep an eye on here". I always thought she was crazy and he was mean so it makes it all the more kooky to me. Husband and I already have a cemetery plot so the issue is resolved for me. Thank gawd! My advice is if the ashes are to be scattered make it an EASY place for your family. I have a friend hanging on to his sister's ashes because she wanted to be scattered over the Amazon River-- Like THAT is ever going to happen. Sheesh. I am glad you said that JJ as I was beginning to think I was the only one who thought it was a little creepy. Oh my, the Amazon River? I would not be that creative. I have a funny story about ashes. We have a beautiful waterfront park. One day this family came down and from what we could see opened an urn and sprinkled the ashes on a bench along the river (probably the dead person's favourite bench). The family stayed for a few minutes, said a prayer then left. 10 minutes later a couple were walking and decided to sit down, they brushed off the bench not knowing it was someone's cremated remains they were sitting on. So be careful where you choose to be scattered. Love the play on the Play School theme. Sometimes I think there is a whole other world out there that I am not even aware of. I am far too young to think about it,surely. A teddy bear? No. Oh yep, you are old enough to think about it, bear or no bear. Yikes to all of those ideas and... creepy about the teddy bear. That said.. my uncle, last year, was cremated. My parents bought an urn for his ashes. The urn is beautiful and with it came 8 very small (about 4 inches tall) urns. The ashes are mainly in the large urn, but also divided into the smaller 8 urns. After the service, my parents gave the smaller urns to certain family members. Mom had the main, large urn. She was planning on spreading my uncle's ashes in her garden. But instead, the ashes remain in the urn... really, though, the urn is beautiful. I do have one of the smaller urns.... a small replica of the larger one. My husband is a little weirded out by it. I put it in my curio cabinet. I have a small collection of angels in the curio and in the center of that collection is the small urn. Me, personally? I want to be cremated. But I don't want to remain in an urn. I'd rather my ashes be spread in the ocean. That is interesting Aleta. I am a bit with Greg, although shouldn't be because it is a far more tasteful way of doing it and as you say the urns a beautiful. Yes, the ocean is a good idea, I like that one, may adopt that myself. OH, one more comment. Some of our relatives said that we should have a Jazz funeral dance in the French Quarter and spread the ashes as we do the walk through New Orleans. The reason we didn't go with this idea was because... honestly.... sometimes... New Orleans just STINKS. People drink too much and get sick or they can't find a bathroom.. or spill drinks. ICK! you must blog about him Aleta, how interesting. LOL No you are probably right - souns like any city in the world where there are lots of people out at night celebrating. No ideal final resting places, lol. Love to go to the French Quarter myself though, alive of course. I have an intersting fact for you, 240 pencils can be made from the carbon from an average body of ash – a lifetime supply of pencils for those left behind. How great would that be? And freaky at the same time of course. Oh my, that may have been a fact I really did not want to know. Yes, freaky. An interesting blog, Lilly. Just last week, my hubby took me up to the mountains where he hunts and showed me the place where he'd like his ashes be spread when he dies. I'm still undecided whether to be cremated or be buried. I know that I'll not feel anything once I die, but just the thought of being burned make me cringe. I do, however, like the idea of not taking anymore space on this earth. I thought, perhaps, donating my body to science? The donating your body to science has been topical this week as our Prime Ministers father died and this was his wish. th eonly thing about it is they keep the body for years sometimes then eventually give the remains back to the family to cremate or bury. I wondered if that would be hard on the family doing that so long after the person died. I guess given you work in the medical field you could see the reasons for doing this and the priority. I know you are dead so it doesnt matter but I wouldnt like the thought of young medical students cutting me up....do like your husband and be with him - sounds a wonderful location. Hope he gets to go hunting as clearly it means a lot to him.